OK, so fried chicken isn’t the healthiest thing to eat, but it’s fine in moderation, people! 3 lbs chicken pieces for frying, wings, drumsticks, breasts, etc. Place the flour, seasoning, and about 5-6 dashes of pepper in a large ziplock bag. Shake the chicken in the bag of flour and shake. Remove the chicken, dip in the whisked egg and place in the bag of flour mixture and shake once more. 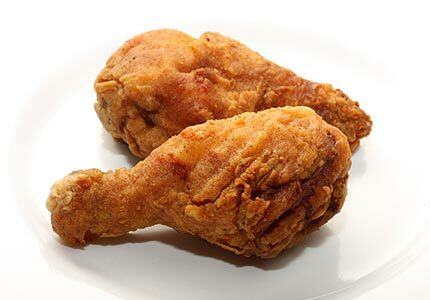 Deep fry for 10 minutes, rotating the chicken every few minutes. Finish off the chicken in the oven, by baking for about 20-30 minutes covered with foil.